The Arctic tern (Sterna paradisaea) belongs to the family of gulls and terns, the Laridae. The Arctic tern species is distributed in Arctic and sub-Arctic regions of Asia, Europe, North America and also Antarctica. These tern species are famous for their long-distance migrations between the Poles. These terns are monotypic species. The Arctic tern (Sterna paradisaea) is a medium sized tern, measuring 30 to 35 cm in length and weighing 85 to 130 grams. The wingspan is 75 to 85 cm. 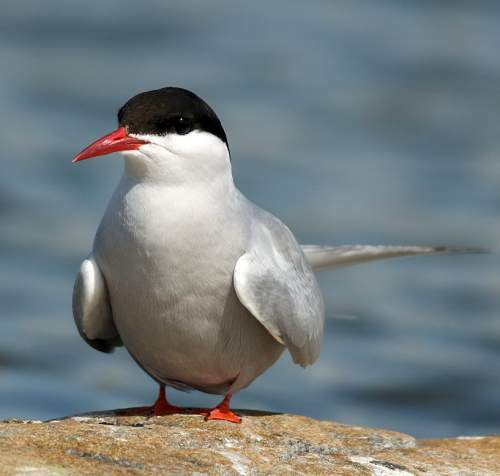 The breeding Arctic tern has black cap covering forehead, crown, nape and eyes. The cheek region is white. The upperparts are gray and the upperwings are pale gray. The underparts are pale gray. The white tail is deeply forked and has long streamers. Both male and female birds appear similar. In wintering birds the crown is whiter. Juveniles have white forecrown, scaly wings, short tail streamers and black bill and legs. The bill is long and dark red in color. The irises are black. The legs are short and dark red. The call of these tern species is a highly vocal "keeek..keeek" sound. The breeding Arctic tern species have a circumpolar distribution in the Arctic and subarctic regions of Europe, Asia and North America. The wintering populations of these species are distributed throughout the Southern Oceans from the edge of the Antarctica to the southern tips of South America and Africa (del Hoyo et al. 1996). Vagrant Arctic terns have been observed in India, Indonesia, Israel, Jordan, Kuwait, Libya, Senegal, Algeria, Central African Republic, Congo, Egypt, Bulgaria, Croatia, Cyprus, Czech Republic, Gibraltar (UK), Hungary, Serbia and Switzerland. The Important Bird and Biodiversity Areas (IBA) of these Arctic tern species in Denmark are, Sydfynske Ø-hav, South Læsø, Roskilde Fjord, Selsø and Kattinge Søerne and Islands and coast between Skælskør Fjord and Glænø. The IBA of these species in Russia are, Solovetski Archipelago and Zjizjginski island, Onega Bay of the White Sea, Valley of headwaters of the river Schuchya, Upper and Middle Yuribey, Lower Yuribey and Basins of the Schuchya and Khadytayakha rivers. The IBA of these tern species in USA are, Prince William Sound, Chukchi Sea Nearshore, Beaufort Sea Nearshore and Barrow Canyon & Smith Bay. The IBA in Sweden are, Holmöarna Archipelago, Archipelago of Stockholm and Archipelago of Northern Hälsingland. These Arctic tern species do not normally occur in forests. They normally occur in altitudes from 0 to 100 meters. The natural ecosystems and habitats of these species include tundra grasslands, tundra wetlands, freshwater lakes, marine lakes, intertidal mudflats, shorelines, tidepools, lagoons, coral reefs and open seas. The diet of these Arctic tern species consists mainly of small fish. Planktonic crustaceans, molluscs, insects, caterpillars and earthworms are their primary food. They catch their prey on dry grounds as well as by plunge diving. The breeding season of these tern species is during May to July in Arctic summer. These species are monogamous and mate for life. There is elaborate courtship. They aggressively defend their nest and the young. The nesting sites are located along northern coastlines, inshore islands, tundra, sand or shingle beaches and ridges (del Hoyo et al. 1996). The nest is a shallow scrape on sand, shingle beach, hummocks in peatlands and sedge grass. The tern clutch contains two oval buff colored eggs with dark mottling. Both the parents incubate the eggs for 22–25 days. The chicks fledge 21-25 days after hatching. The chicks are brooded by the parents for the first ten days after hatching. These tern species are fully migratory and are transequatorial migrants. They migrate southwards during October and November and return to their breeding grounds in early summer. These tern species are long distance migrants and some birds attached with tracking devices have been found to fly and wander for nearly 96,000 kms before reaching the starting point. The global population size of the tern (Sterna paradisaea) is estimated to be about 2,000,000 individual birds. The overall population trend of the species is considered to be decreasing. In most of its range, this species is reported to be fairly common to uncommon. The generation length is 13.4 years. Its distribution size is about 65,700,000 sq.km. Habitat alteration and destruction, climate change, pollution and reduction in prey-fish populations are the main threats that are endangering the survival of these species. 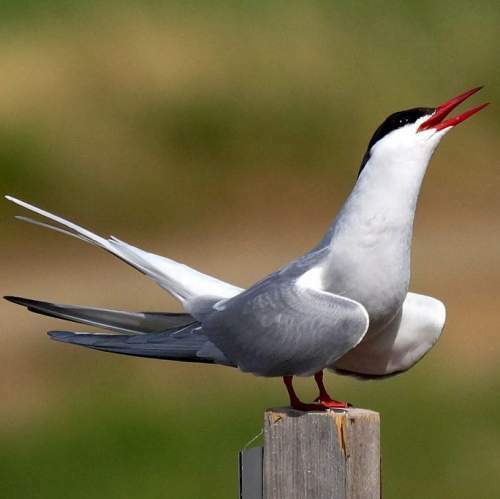 The Arctic tern (Sterna paradisaea) does not approach the thresholds for being Vulnerable, either under the range size criterion, or under the population trend criterion or under the population size criterion. The CITES (Convention on International Trade in Endangered Species of Wild Fauna and Flora) status is ‘Not Evaluated’ for the Arctic tern (Sterna paradisaea). The Arctic tern (Sterna paradisaea) is closely related to roseate tern (Sterna dougallii), South American tern (Sterna hirundinacea), common tern (Sterna hirundo), Antarctic tern (Sterna vittata), white-fronted tern (Sterna striata) and black-naped tern (Sterna sumatrana). Current topic in Birds of India: Arctic tern - Sterna paradisaea.